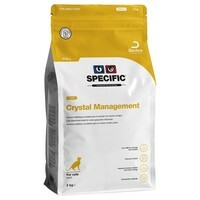 Specific Crystal Management Light FCD-L Dry Food for Adult Cats is a nutritional diet to help prevent the recurrence of struvite and calcium oxalate stones; particularly ideal for cats needing to control their weight. Made with a complete balance of high quality and highly digestible ingredients that give the diet a moderate energy content, the diet will help your cat maintain an idea bodyweight, while also having a beneficial effect towards their skin, coat and joints. Specific Crystal Management also works to increase the acidity pH of your cat’s urine to help dissolve existing struvite crystals and oxalate stones, while a limited content of magnesium and phosphorus help prevent new crystals from forming. Fish Meal, Maize Protein, Maize, Wheat, Rice, Potato Protein, Maize Starch, Cellulose Powder, Pork Fat, Animal Protein Hydrolysate, Vitamins and Trace Elements (including Chelated Trace Elements), Minerals (including Tri-Potassium Citrate), Fish Oil, Methionine, Egg Powder, Ammonium Chloride, Psyllium Husk, Taurine, Beet Pulp, Chondroitin Sulphate, Yucca Powder.